Cities are prime venues in which we can tackle climate change by crafting and implementing proven, common-sense building energy efficiency interventions that reduce energy consumption, save money, and cut back harmful emissions associated with energy generation and use. In this post, we take a look at Chicago’s new building energy rating system and how it aims to make building energy performance scores easier to understand and more visible to the public—helping renters and investors evaluate the energy efficiency of a building before making a decision. 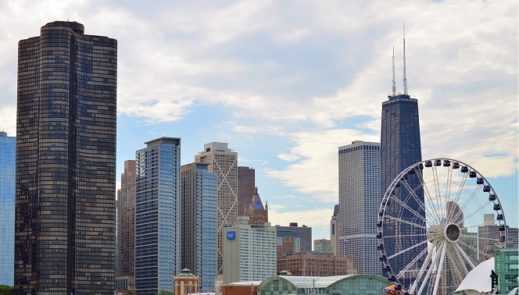 As 2019 approaches, the city of Chicago is preparing to launch the Chicago Energy Rating System, a required building energy performance rating. This new label system builds upon the city’s successful Energy Benchmarking & Transparency Ordinance—Chicago continues to see significant energy and cost savings associated with energy benchmarking—in 2017 alone, ENERGY STAR scores increased by 8 percent over scores reported in 2016. Cumulative energy savings over the past three years equal $39.2 million in reduced costs, and investments associated with these savings have supported an estimated 900 jobs while greenhouse gas intensity is down by 19 percent from 2015 to 2017. The new energy rating system will be the first requirement of its kind from a U.S. city, following similar initiatives in Australia and the European Union. In Australia, rated office buildings have saved over $400 million in energy bills since 2010. In Chicago, all properties over 50,000 square feet (sq. ft.) are required to complete energy benchmarking and report the results to the city annually. This new rating system will use the results from existing energy benchmarking reports, specifically 1–100 ENERGY STAR scores, and will assign each reporting building an energy performance rating from 1–4 stars. Labels aim to make energy efficiency—which is typically invisible—visible to everyone. This provides a clearer picture to those who value efficiency so they can put their money where their values are, sending market signals that highlight a demand for efficient buildings. With increased demand for efficient building, will come increased action that will provide outsize economic, social, and environmental benefits. The four-star rating system is based on the four-starred Chicago flag, which is a really big deal in Chicago and a ubiquitous civic symbol across the city. Buildings that do not comply with the energy benchmarking requirements will receive zero out of four stars. Also, properties that are not eligible to receive an ENERGY STAR score (about 13 percent of the properties reporting in Chicago) will be assigned a rating based on their energy use per sq. ft., as compared to national medians for similar properties. Once a rating is assigned, the building owner will be required to post it in a prominent location, (such as a lobby, front door, or elevator bank), as well as share it at the time of listing the property or a portion thereof for sale or for lease. Building owners will have a six-month grace period after the initial energy ratings are assigned before they are required to post the new Energy Rating Placards. Importantly, any property that has voluntarily improved its 1–100 ENERGY STAR score by 10 or more points receives an extra star as recognition for making the improvement. This rating system thus recognizes both current performance and recent improvements. 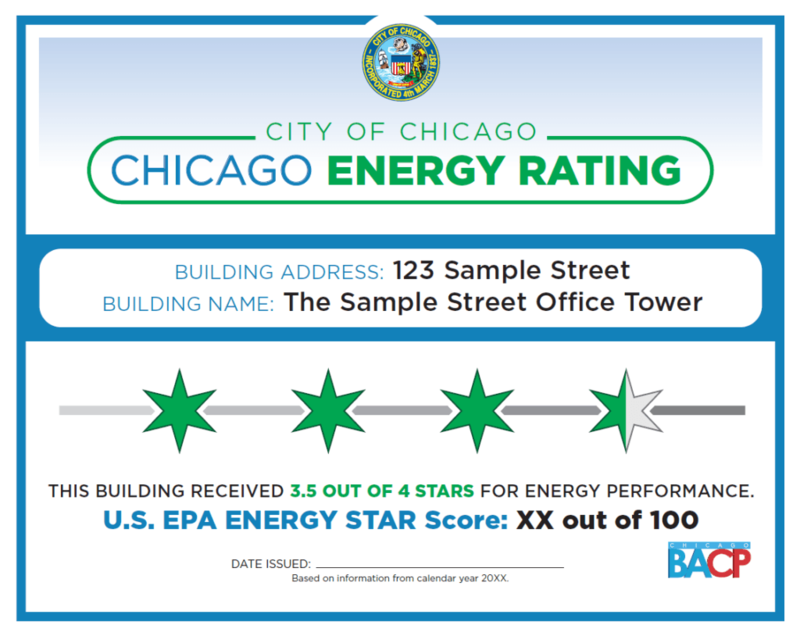 The Chicago Energy Rating System is intended to increase the transparency of reported building energy information while making the data easier to understand. While most energy professionals know and understand the meaning of the 1–100 ENERGY STAR score, the average person may not know it even exists. In addition, while a score of 75 is considered a high performer on the ENERGY STAR scale, a score of 75 on your math test is typically not considered good, leading to possible confusion among the general public. By providing a simple rating and making these ratings more transparent, the city is attempting to further increase awareness of energy performance and costs, thus driving new action to improve energy efficiency. As I mentioned earlier, raising awareness helps for cities and businesses looking to reduce carbon emissions and save money. In addition, the new system recognizes that in order for a rating system to be effective, real estate stakeholders need to believe that the ratings are appropriate and accurate. One of the most unique features of Chicago’s initial energy benchmarking policy is its data verification requirement. All reporting properties are required to complete professional data verification once every three years, in addition to providing energy benchmarking reports every year. Data verification does not have to be done by a third party, but must be completed by a person with a city-recognized license or training credential (the full list of recognized licenses is online here.) By sourcing the new rating system’s stars on this benchmarking data and including this extra level of data verification, the city ensures that the new ratings can be trusted. As cities like Chicago continue to lead the charge on solutions to make buildings more efficient, stay tuned to IMT’s blog where we’ll periodically share their stories and provide updates on key challenges, best practices, and lessons learned along the way. Have a question about the Chicago Energy Rating System? Visit here to learn more or send me an email at amy.jewel@imt.org. Sharing Data to Motivate Action is intended to help implementers of benchmarking and transparency policies understand the latest techniques for developing energy benchmarking scorecards, also called energy benchmarking profiles, which present energy data to building owners as actionable information to encourage investment in efficiency. IMT is helping cities take the next step with energy benchmarking data. Can Behavioral Economics Help Energy Efficiency? Harnessing the irrational side of people to motivate action. Chicago releases its 2nd annual energy benchmarking report.